As you can see in the second image, the unread message is thinner than the first image. It's probably on bold too, just not as bold as the first image. Anyone knows how to fix this on Nougat? Update: This appears to be due to the default font used by Chrome on Nougat. Any ideas how to change that? 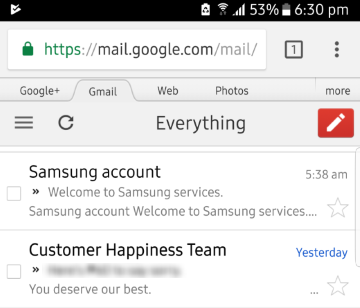 Changing the Android system fonts didn't affect Chrome. Browse other questions tagged samsung custom-roms gmail chrome-for-android samsung-galaxy-s-6 or ask your own question. 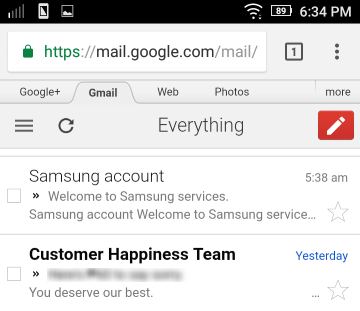 Quick way to show unread emails in inbox in Gmail app? Why does my Droid RAZR play the new email notification when I visit my inbox on my PC?